Often overlooked by travellers, Guadalajara is a fascinating city with a wealth of cultural sights, mouth-watering cuisine, and some incredible nightlife. Mexico’s 2nd largest city is located in the state of Jalisco, which is home to two of the country’s most famous exports – tequila and mariachi. While it most definitely lives in the shadow of the capital, there’s a lot going on in Guadalajara to add a stop here on your Mexico travels. In just a few days here, you can take in the sights of the historic city centre, visit the country’s largest lake, and join the raucous crowd for a football game. These are just a few of the many things to do in Guadalajara, one of the top places to visit in Mexico. 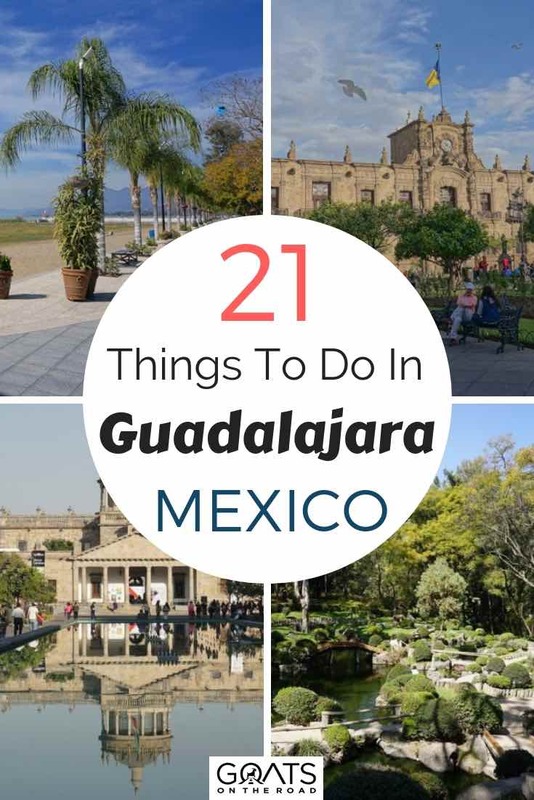 Make the most of your trip to the city by checking out this list of top 21 things to do in Guadalajara. The best way to get introduced to Guadalajara is with a stroll through the Centro Historico (Historical Centre). 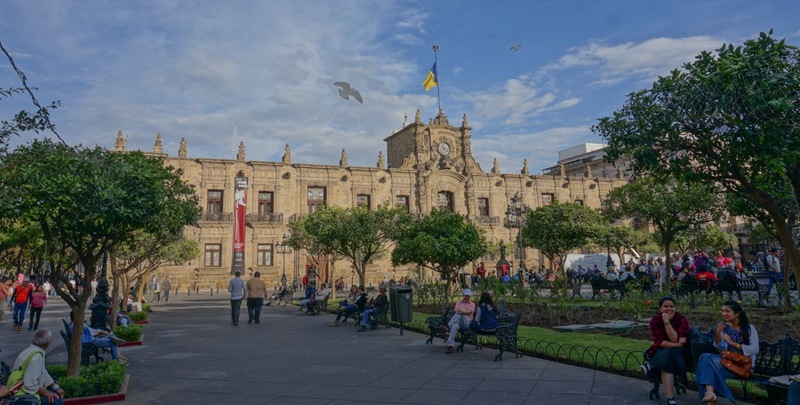 Here you’ll find tree-lined plazas, gorgeous cathedrals, important cultural institutions, bustling markets, and lots more. It’s a great place for a casual stroll, as there are several pedestrian-only streets. The beautiful Plaza de Armas. 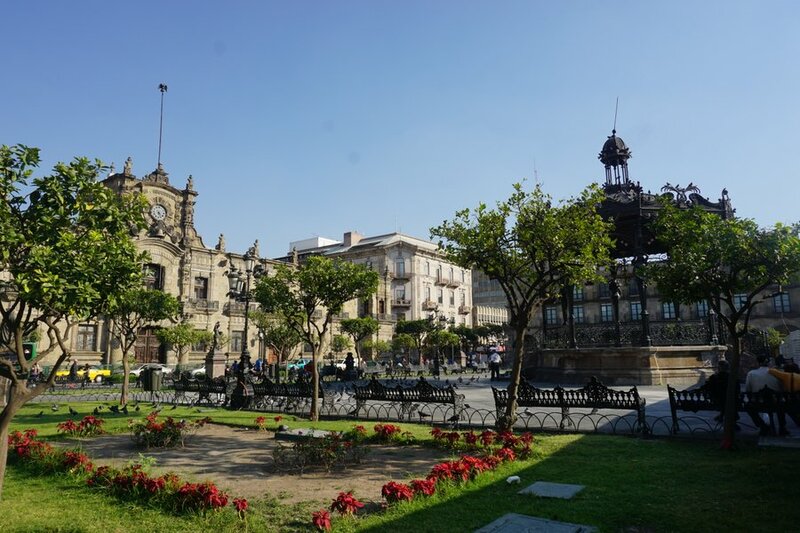 Start your exploration off in the Plaza de Armas, which is surrounded by the double-spired Guadalajara Cathedral and the historic Governor’s Office. Be sure to walk through the nearby Liberation Square to snap a photo with the Guadalajara sign. 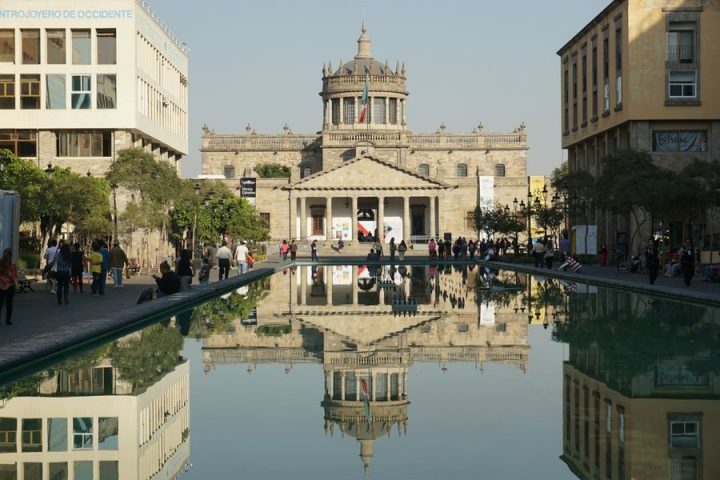 From here you have easy access to several museums, such as the Regional Museum of Guadalajara. You could also just grab a coffee and watch the city go about its day. While the historical centre is easily visited on your own, it’s always more beneficial to get a local’s perspective on the city. Every morning at 10AM, you can join in the free walking tour to take in the sights along with insights from a local guide. Tours meet at the gazebo in the Plaza de Armas and last about two hours. 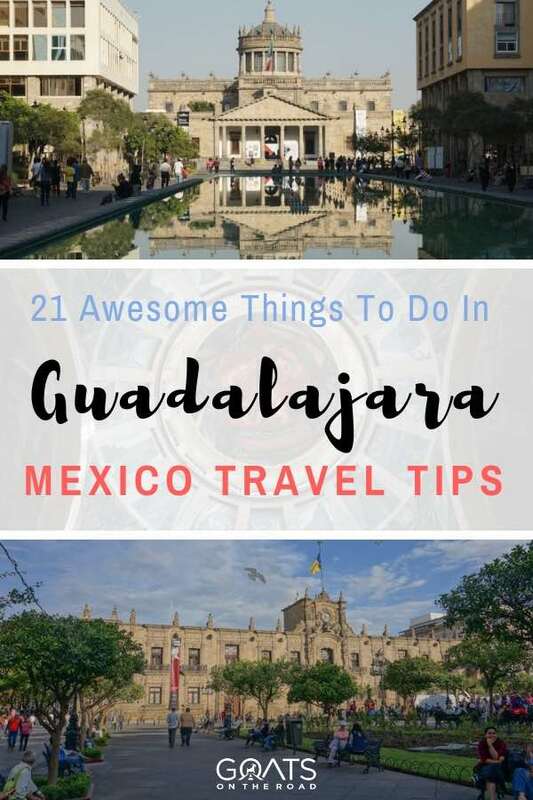 In addition to learning about the history and culture of Guadalajara, you’ll get solid recommendations from someone who knows the city and you’ll probably end up making a few new friends. Going on a walking tour is one of the best things to do in Guadalajara to get your bearings in the city. All that walking around is sure to make you hungry. 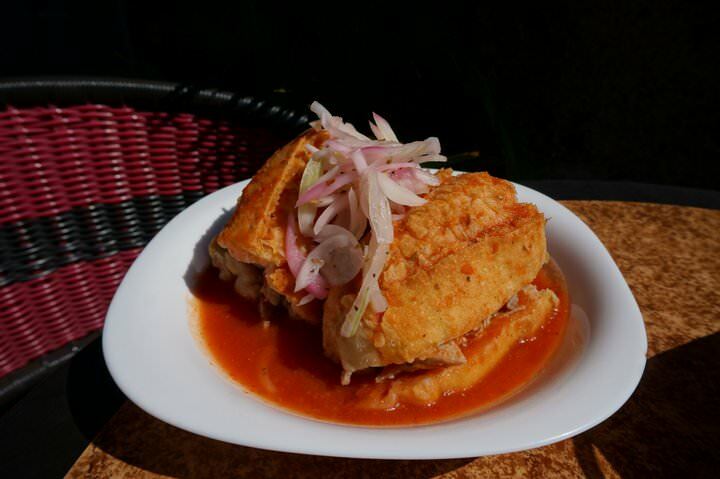 When in Guadalajara, you can’t miss out on the local favourite known as tortas ahogadas. The name literally means “drowned sandwiches,” and you’ll know why as soon as you see one. These local specialties are typically made with birote bread and chopped fried pork. The sandwich is then completely drenched in a sauce made primarily from dried chili peppers. They’re then served up with some slices of white onion, radishes, and the typical array of salsas and hot sauces you’ll find on any Mexican table. Grabbing one of these sandwiches is one of the best things to do in Guadalajara when you have a hangover! The locals consider it the best cure. Eating amazing food is definitely one of the top things to do in Mexico. ☞ See Also: Things To Do in Playa del Carmen – 21 Things You Won’t Want To Miss! This 18th century building looks very unassuming from the outside, but once you enter, you’ll be rewarded with stunning murals from the artist Jose Clemente Orozco. The size of the paintings are incredible, especially the one of Hidalgo which is located on the main staircase. 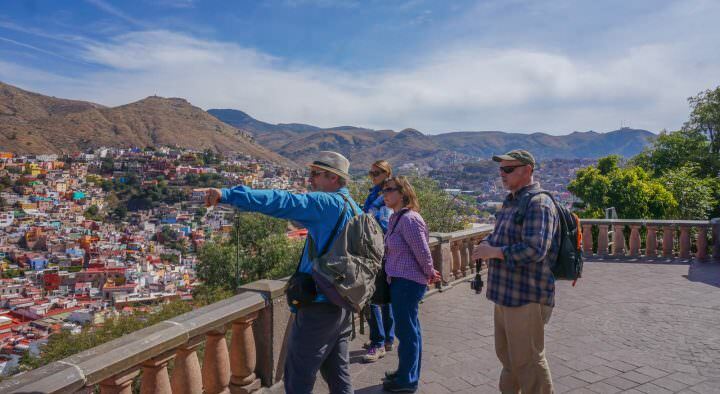 The Government Palace is free to enter, making it a top activity for those who are backpacking Mexico on a budget. Note that it’s not open on weekends. Perhaps no type of Mexican music is more famous than mariachi. It even made the UNESCO list for Intangible Cultural Heritage a few years ago. Everywhere you go in Mexico, the sounds of mariachi music follow, whether it’s a roaming band on the beach or the presidential inauguration ceremony. Seeing mariachi is one of the best things to do in Guadalajara. It’s believed that modern-day mariachi music originated in Jalisco, the Mexican state that Guadalajara is the capital of. As such, there’s no better place to dive into this traditional Mexican music than right here in GDL. If you’re looking to take home some unique souvenirs from your trip to Mexico, you’ll want to be sure to include a trip to nearby Tlaquepaque (try saying that one three times fast). Once its own city, Tlaquepaque was absorbed by the urban sprawl of Guadalajara and became a municipality. Tlaquepaque is famous for its beautiful, hand-painted pottery. In the Nahuatl language, the name actually means “place above clay land.” You can start off in the Mercado de Artesanías to get a feel for what’s on offer, and then branch out and visit more of the individual shops in town if you want to see more. One of the most interesting things to do in Guadalajara is pay a visit to the Cultural Institute Cabañas. It was founded in 1791 as a hospital/orphanage by the Bishop of Guadalajara and eventually became a cultural institution. It’s a beautiful neo-classical building with several courtyards and galleries to explore. The amazing mural on the ceiling. 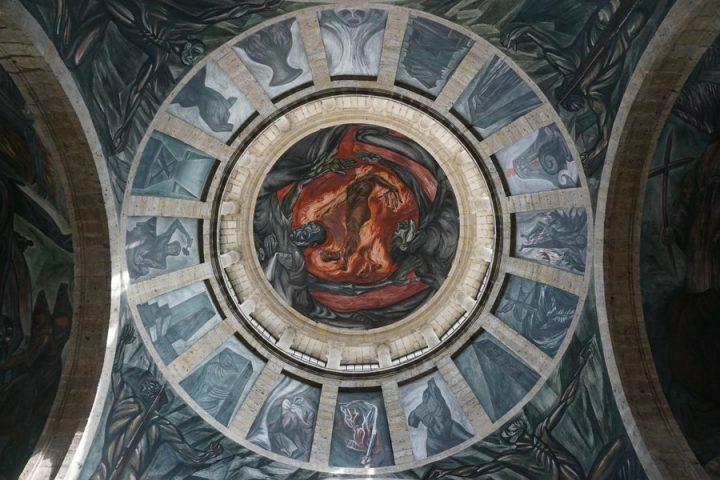 The highlight of visiting is definitely seeing the amazing frescoes by Mexican artist Jose Clemente Orozco, including his famous work Hombre de Fuego (The Man of Fire). It’s closed on Mondays but free to visit on Tuesdays. Otherwise it costs about $2 to get in and another $1 if you want to use your camera. Did you know that Mexico’s most famous beverage comes from a town by the same name? Not far from Guadalajara, you will indeed find the Mexican town of Tequila. Taking a trip up there to visit the agave fields and a few of the distilleries is without a doubt one of the coolest things to do in Guadalajara. 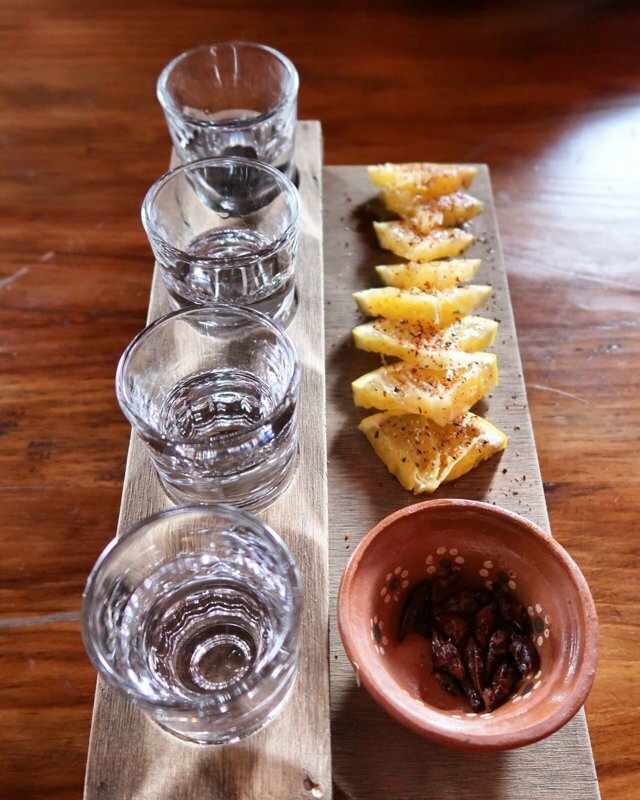 You have several options for visiting Tequila, from simply catching a local bus and doing it yourself to taking a ride on the famed Tequila Express train. 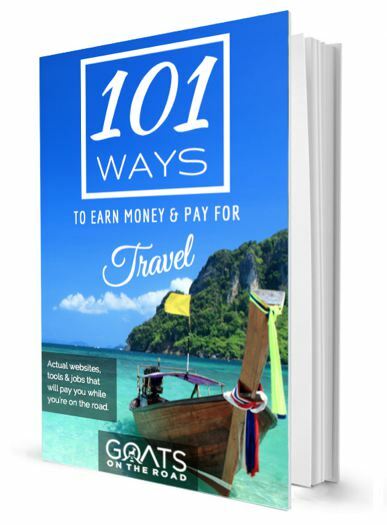 It’s a bit pricey, but it’s certainly an awesome experience that’s worth splurging on. One of the most fun things to do in Guadalajara is taking the Red Pub party bus to the lucha libre fights. Every Tuesday night, they roll out their British double-decker bus and head to Arena Coliseo to take in the high-flying Mexican wrestling. The tour includes round-trip transportation, your ticket to the matches, and even a free beer back at the pub! Even if you’re not a huge wrestling fan like me, a night of lucha libre is tons of fun. My wife constantly rags on me for my love of American pro wrestling, but she loves going to lucha libre and has already seen three shows. 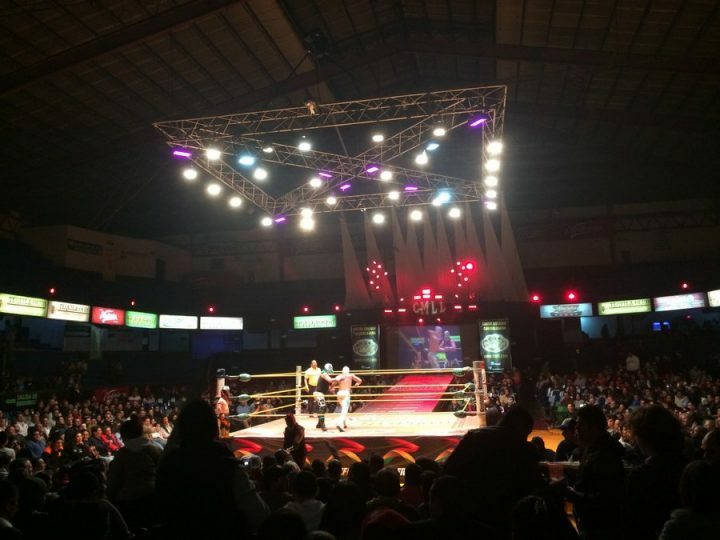 We even put together a handy-dandy guide to seeing lucha libre in Mexico for you, so check it out and add it to your itinerary in GDL. Forget about Corona and Modelo when you’re in Guadalajara and try some of the city’s awesome cervesas artesenales (craft beers). The craft beer scene is rapidly expanding here, meaning you have several choices for where to grab a pint. One of my personal favourite spots to sip on a tasty craft beer in GDL is the Patan Ale House. They’ve got tons of awesome local beers on tap, a solid menu of creative bar food, and they even have DJs spinning on the weekend. Salud! 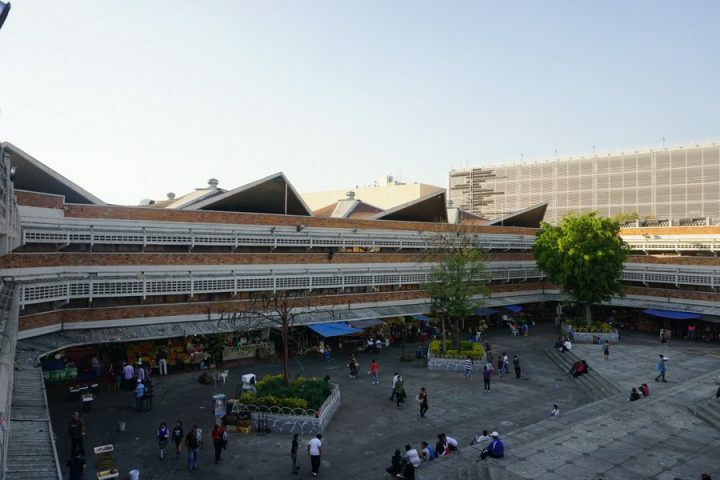 Mercado Libertad is a sprawling indoor market located in the historic centre of Guadalajara. For an all-out assault on your senses, wander around the maze-like stalls of this huge market that seems to be selling just about everything under the sun. There’s fresh produce, bootleg DVDs, leather products, and even pets for sale here. There are hundreds of stalls in this market. It’s best to come to the market hungry, as there’s a large food court here cooking up several local specialties, such as the aforementioned tortas ahogadas and delicious bowls of pozole. It’s fast, cheap, and super local – a winning combination. There are different festivals going on all throughout the year in Guadalajara, so be sure to check the calendar before planning your trip. You might end up in town during a literary, film, or music festival. 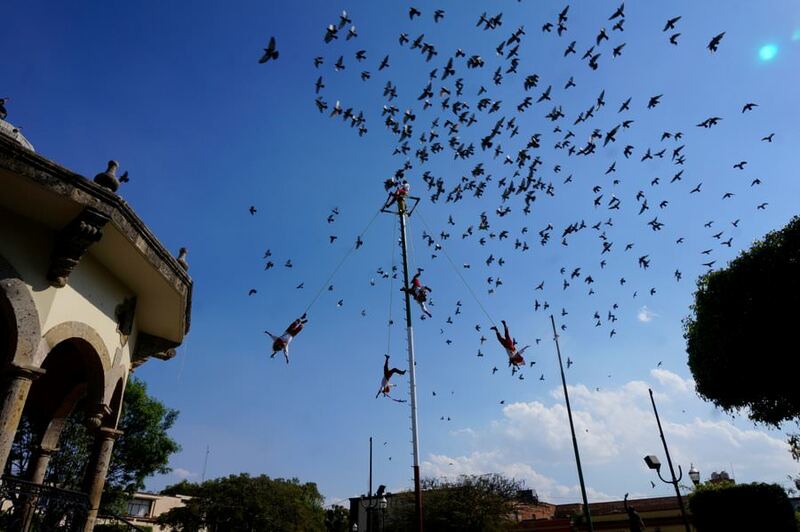 In Mexico’s 2nd biggest city, there’s always something going on. 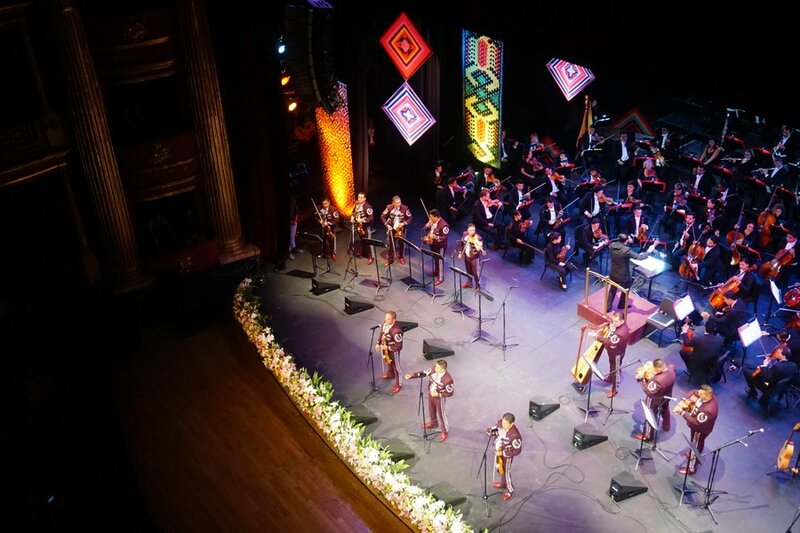 One of the most famous and important events of the year in GDL is the International Mariachi Festival, which takes place at the end of August. There are parades, free concerts in the square, and gala shows with world-class mariachi musicians in the theatre. Speaking of the theatre, that brings us to the next point in our long list of things to do in Guadalajara. 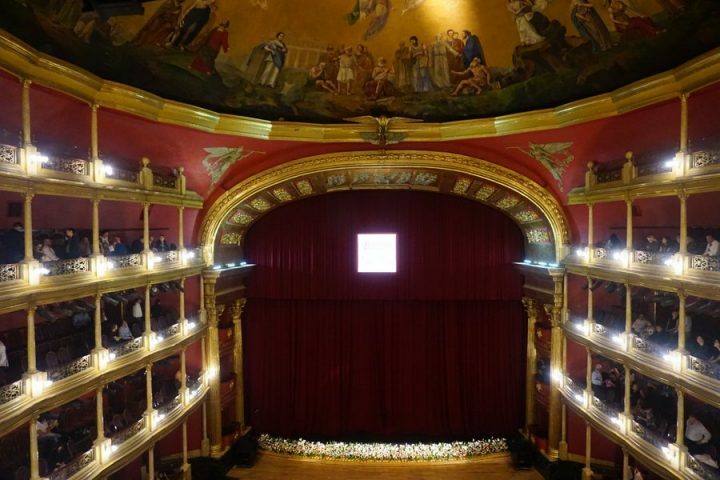 One of the most beautiful buildings in Guadalajara, Teatro Degallado is a neo-classical theatre in the historical centre of the city. To truly admire the building, you’ll have to go inside and see the incredible murals. It’s free to enter when there isn’t a show on. What a cool place to see a show! There are regular performances in the theatre, including operas and symphony orchestras. If you’re lucky, you can score tickets to one of the gala performances during the mariachi festival. 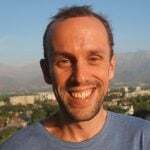 I attended one this year and highly recommend it if you get the chance. Another dish that Guadalajara is famous for is birria – a spicy stew usually made from goat or lamb. The meat is perfectly seasoned and incredibly tender and is a must-try when in the city. While there are tons of places cooking up birria in Guadalajara, few places do it better than Birreria las 9 Esquinas. You might have to wait for a table here, but it’s definitely worth it to try this local specialty. Parque Colomos is a large green space in the northwest part of the city. It’s full of walking paths and picnic areas, making for a great place to spend a leisurely afternoon outdoors. A trip here is a nice break from the hustle and bustle of downtown and is one of the more relaxing things to do in Guadalajara. A peaceful stroll through the gardens. 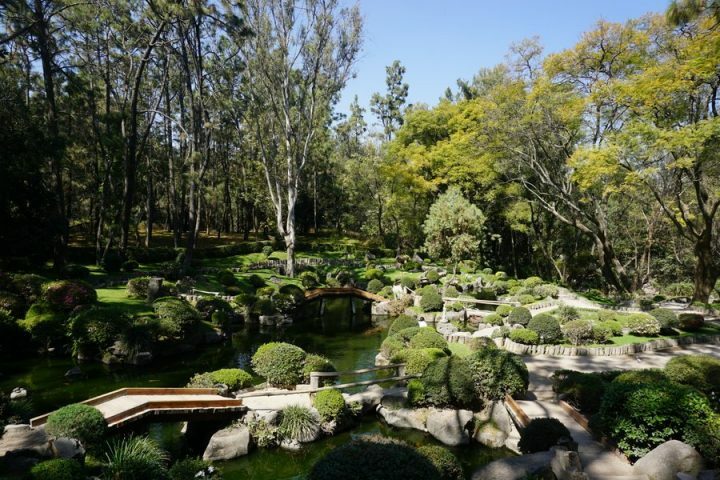 The best part about taking a walk through Parque Colomos is being able to see the stunning Japanese gardens. If you can ignore the guy blasting reggaeton through his cell phone, it’s almost like you’re actually in Japan. Not far from Guadalajara (about a 45 minute drive), you’ll find the amazing archaeological site known as Los Guachimontones. It dates back to the Teuchitlan tradition, a pre-Columbian society that existed from around 300 BCE to 900 CE. This site is notable for its circular stepped pyramids, which are not found anywhere else in the world. Exploring this archaeological wonder is one of the most interesting things to do in Guadalajara and well worth the day-trip. 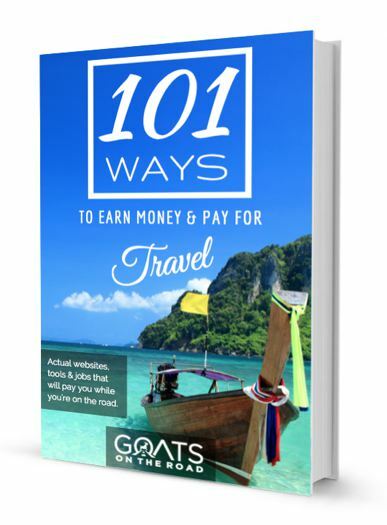 It costs 30 pesos to enter, or you can hire a guide on site for 200 pesos. If you’d prefer, you can join a tour. Football is a huge part of Mexican culture, whether it’s cheering on the national team during the World Cup or watching local teams compete in the Liga MX. 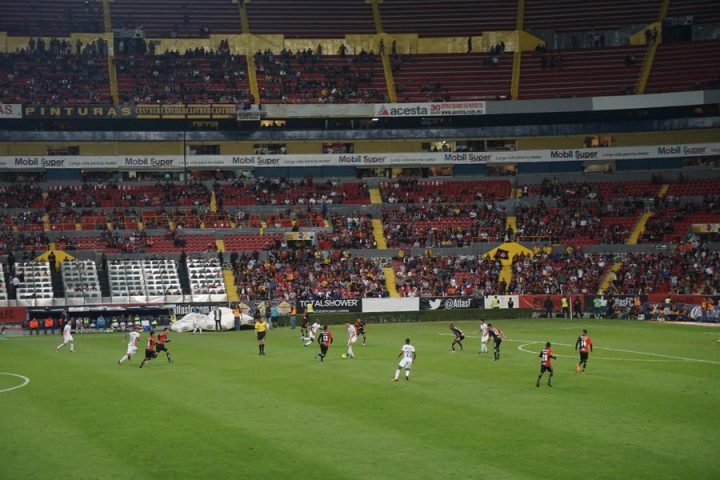 Guadalajara is home to two teams – Chivas and Atlas. The former plays at Estadio Akron while the latter hosts their games at Estadio Jalisco. Cheering on Atlas at a home game. The dynamic between the two teams is kind of like that between the Yankees and Mets. One wins all the time and the other, well, doesn’t. If you want to watch one of the best teams in the league, jump on the Chivas bandwagon. If you’d rather root for the underdog, give your support to the fledgling Atlas squad. Either way, you’re guaranteed a beer-soaked celebration if the local heroes win. Guadalajara is a city that likes to party, and one of the best places to do so is Avenida Chapultepec. This trendy street is full of restaurants, bars, and clubs and is fun any night of the week. On the weekend, you’ll also find a bustling market on the island in the middle of the avenue. Local merchants peddle all sorts of wares here, and it’s a really vibrant, colourful scene. If you’re wondering what to do in Guadalajara on a Sunday, this is it. While the party goes really late on Saturday night, Avenida Chapultepec transforms come Sunday morning. 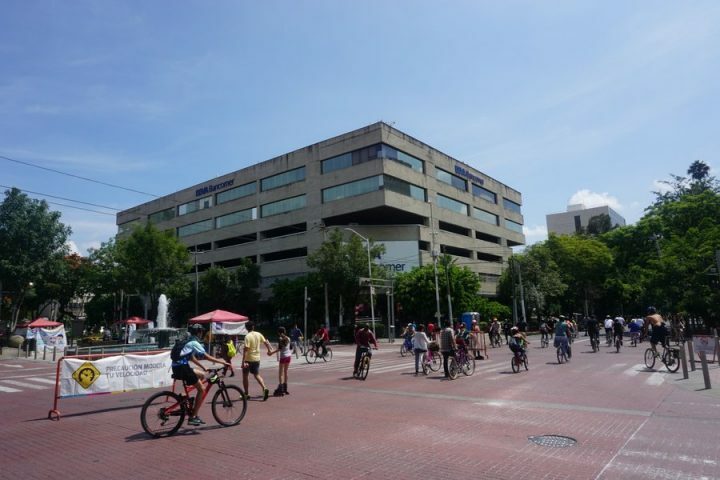 Every week from 8AM-2PM, half of the street is shut down to all motorized vehicles. Joggers, cyclists, dog-walkers, and skaters all take to the streets to enjoy a few hours free of the grid-locked traffic that usually plagues the city. You’ll also find pick-up volleyball games, group fitness classes, and various non-profit organizations set up along the road. If you’re in the city on a Sunday morning, be sure to check it out. For some great views of the canyon and some fresh air, head up to Parque Mirador for a short hike. After walking up to the viewpoint, you can sit down to lunch at the Restaurant El Mirador. This makes for an easy and fun half-day trip out of the city. It’s tough to get yourself out here on public transportation, so you’re better off ordering an Uber. Try to arrange for them to come back and get you a few hours later. Located about an hour drive south of the city is Lake Chapala, the largest freshwater lake in all of Mexico. 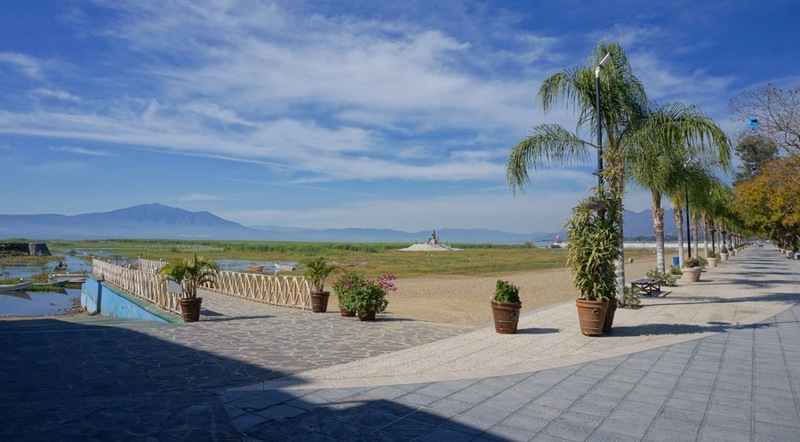 There are several different towns along the lake shore you can visit, such as Chapala and Ajijic. 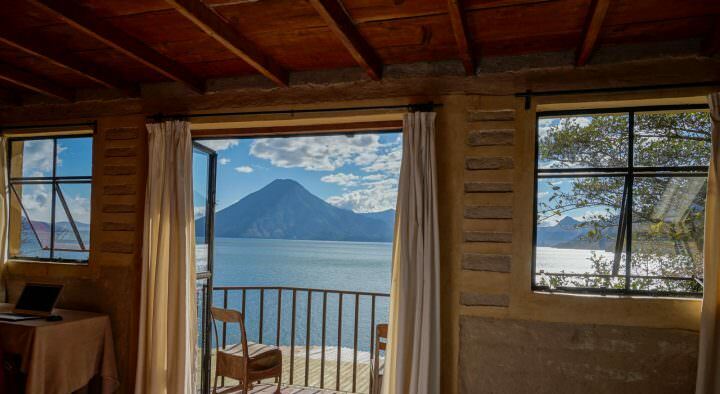 Thanks to its moderate climate and beautiful surroundings, Lake Chapala is also a favourite of expats, snowbirds, and retirees. The lake is a very popular place for locals to visit on weekends and holidays. As such, it’s better to visit during the week if possible. Enjoy a stroll along the lakefront Malecon or go on a short boat trip out to the small islands. If you’ve got a few days to spare, I highly recommend staying for a night or two. As you can see, Guadalajara is a city that has a lot to offer prospective travellers. It’s got all the perks of a big city minus a lot of the downfalls. 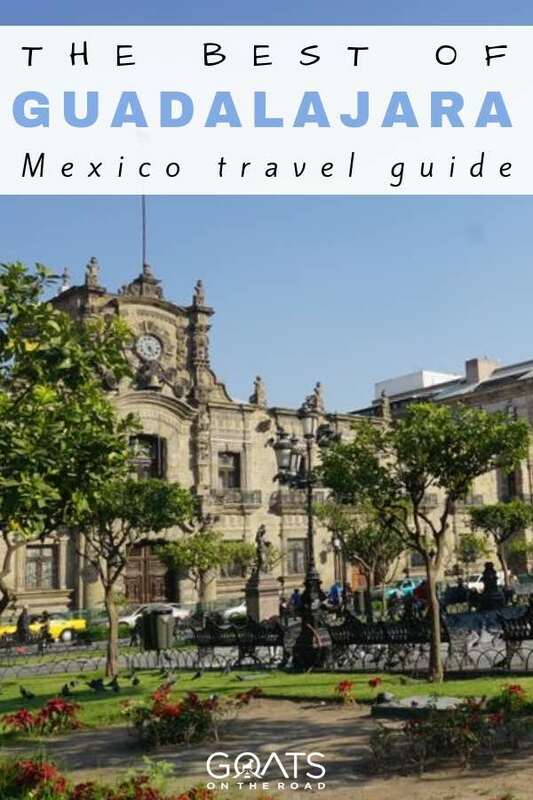 For instance, while there are incredible things to do in Mexico City that you shouldn’t miss, Guadalajara is much smaller and easier to get around than the capital. There’s enough to see in the historic centre to keep you busy for a day or two, plenty of awesome day-trips to scenic locations, and excellent culinary and nightlife scenes to come home to. Don’t skip out on Guadalajara! If you’re planning a trip to Mexico, be sure to add Guadalajara to your itinerary. It’s the perfect place to stop for a few days on a longer trip around Mexico. For example, we visited in between travelling around Guanajuato and enjoying all of the awesome things to do in Puerto Vallarta. However you get here, you’re sure to have a great time exploring this exciting Mexican city. Thanks so much Nate! Sounds like you guys are giving back a lot, that’s great!